November | 2014 | Where in the World Are Our Kids? Making Sure More Have a Merry Christmas! It is amazing to see how God has worked in the lives of our children over the past two years, and it is our sincere hope that we would continue to have an impact on the orphan community while we are in Ghana. I hope to volunteer at a clinic that is on an orphanage property, treating not only the orphans there, but the Muslim women in the community as well. Not everyone is called to pick up and move halfway around the world to help orphans, or even to foster or adopt an orphan. But we are all responsible for caring for the fatherless, the poor, and the foreigner. Scripture encourages us over 30 times to care for the fatherless, to include them in our prosperity, to defend them when they cannot defend themselves. Cultures of poverty can lead to families having to give up their children to orphanages or selling them into slavery. Most of the world’s orphans have extended family, but they are too poor to care for the children. The good news is that by adjusting our spending habits, we can significantly reduce the number of orphans and slaves in the world. In this season of abundance and generosity, please consider to remember where your gifts have come from, and the hands that were made to produce them. For instance, there are 242,000 young people in slavery in Ghana, many of them children, and many working in the chocolate industry. Most of us buy chocolate near the cash register that supports that slave industry. If we were to look a little harder in the candy section, most grocery stores carry Fair Trade chocolate, such as Divine Chocolate, which is produced by the farmers in Ghana who are paid a not only a fair price for their crops, but an additional financial investment to help bring their communities out of poverty. Coffee is another commonly purchased item that we almost all have in our homes. In fact, coffee is the second most traded commodity in the world, next to oil. Coffee growers typically receive as compensation only 10% of what we pay for coffee when we buy from the big brands. Growers are often forced to sell their coffee for less than what it cost to produce it, essentially enslaving them as they have to work their way to pay off what it cost them three years to grow. If we all pictured those trapped in poverty by our brand loyalty when we hit the switch on the coffee machine in the morning, it wouldn’t really be “the best part of waking up,” would it? If instead we all decided to purchase Fair Trade coffee rather than the most popular brands we see advertised, we could shape the way coffee growers in third world are treated and compensated, bringing hundreds of thousands of people out of poverty. Those are just two examples of how our dollars can be used to treat those in developing countries with fairness and justice. There are many more ways you can consider making your dollar go a lot further when shopping this Christmas season. Here are just a few of the hundreds of opportunities you can take part in to help defend the cause of the poor, the orphan, and the foreigner. 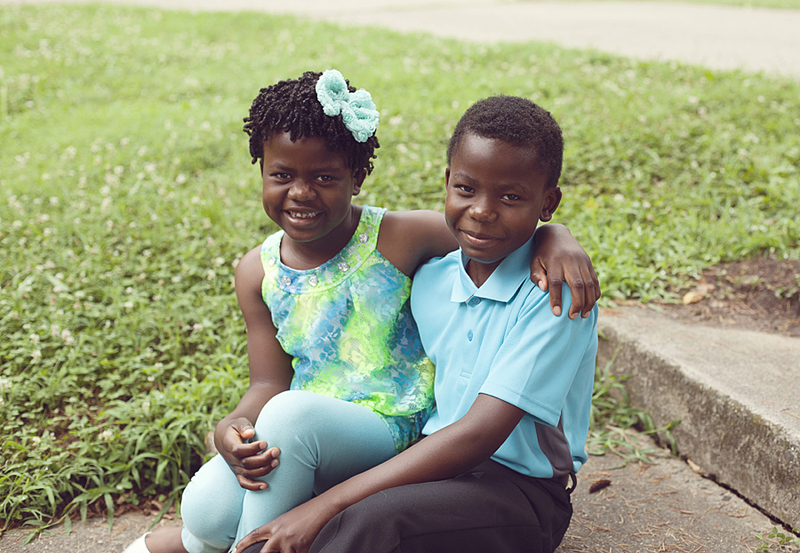 ShowHope.org — The adoption support organization started by Steven Curtis Chapman. Donate to an adoptive family, or shop for a cause. Just Love Coffee — Award-winning coffee roaster sells fresh roasted Fair Trade coffee in support of adoptive families. JubileesJewels.com — Stamped jewelry sold by an adoptive family to support other adoptive families. SOS Children’s Villages International Child or Village Sponsorship. If you sponsor an African child, indicate in the notes that you want to sponsor a child in Tamale, Ghana. We’ll be moving there in the next 2 years and can visit your child! The Hunger Site — A huge site that offers the opportunity to shop to benefit causes that are important to you — Fair Trade, Autism Awareness, Breast Cancer Research, and more. Hundreds of items at great prices from toys, to apparel, to footwear and more. You’ll find lots of great items at this store! PACT — A Fair Trade clothing retailer of fun and funky basics — socks, underwear, t-shirts, and hoodies. Global Mamas — Sells unique handcrafted items in colorful fabrics made by Ghanaian women to improve their standard of living. PartnersForJustTrade.org — Faith-based Fair Trade organization bringing craftsman out of poverty by connecting them with consumers in North America. TenThousandVillages.com — Fair Trade retailer since 1946 providing a wide variety of merchadise for all ages from around the world. NoondayCollection.com — Supports artisans around the world and provides opportunities for adoptive families to raise funds to bring their families together. TradeAsOne.com — A store and subscription-based Fair Trade service that ships grocery items every 3 months for around $1 a day. Introduces consumers to the variety and quality of Fair Trade items. Fair Indigo — A retailer that allows you to shop your conscience, carrying Fair Trade, USA-made, upcycled, vegan, and organic items. This retailer has been a consistent favorite of ours! Buy clothing and household items at second-hand stores that support charity rather than slavery. Buy coffee from Fair Trade sources, then add more Fair Trade products over time. Review BetterWorldShopper.org or Free2Work.org to rate practices of the retailers you frequent. Investigate your slavery footprint at SlaveryFootprint.org. Even if you may not be able to make a difference with all of your purchases this Christmas season, each and every purchase helps! Your dollars let retailers know that you care when they donate products to good causes, use ethical sourcing, and pay their workers fair wages. Every time you make a purchase, you are essentially voting on how you believe we should treat employees around the world. Two years ago, Addie had been just diagnosed as being developmentally delayed. In spite of the fact that we now knew that she was six, the experts determined that she functioned at the level of a three year old. She could barely climb stairs while alternating feet. She didn’t walk as much as she toddled. Her femurs were bowed from rickets. Heavy metal deposits laced her bones. Her bone marrow was hyperplastic (enlarged). She only spoke a few individual words of English. “Balloon.” “Dog.” “Airoplane.” We had no idea what she was thinking or feeling, except for her grief expressed through peeing on furniture, hitting other children, and stealing toys from school. Today, Addie has met her goals for her IEP in language, reading, fine motor skills and gross motor skills. She plays hockey on roller blades in the driveway. She loves to read, and to talk. She is loved by her classmates. She tells stories, expresses her feelings, loves Jesus, and has the gift of intercession. When faced with high expectations, she rises to them, even if she wants you to believe she’s not capable. Her speech therapy this year has helped her make amazing strides in her articulation. God is doing amazing things in Addie’s life. Two years ago, Palmer screamed for hours after every trip to church, but we were never sure why because he didn’t have the words to express what was wrong. He was being moved from Kindergarten to first grade after only 6 weeks, because we had just found out he was 8 instead of 5. His teacher reported that he said three words, “Yes, no, and pizza.” The expression on his face varied from flat to livid. He was defiant to women in authority. He was an angry grieving boy, who would not allow anyone to comfort him in his sorrow. Today, Palmer loves going to church. He can repeat verbatim the lessons told in Sunday School, children’s church, and even adult service. He loves God, who has transformed Palmer into a joyful leader with a discerning eye for how things work and how to make them better. He loves to ask difficult questions, like “Why are there so many doctors in America and not enough in Africa?” and his greatest dream is not a trip to Disney or an XBox 360, but for there to be enough doctors in Africa to take care of the sick people there. God is doing amazing things in Palmer’s life. Two years ago, Ken was working six evenings a week and all day Saturday and Sunday, between Upward Sports, college ministry, and regular church activities. It was exhausting him and breaking our fragile family. Time when all four of us were together was rare. 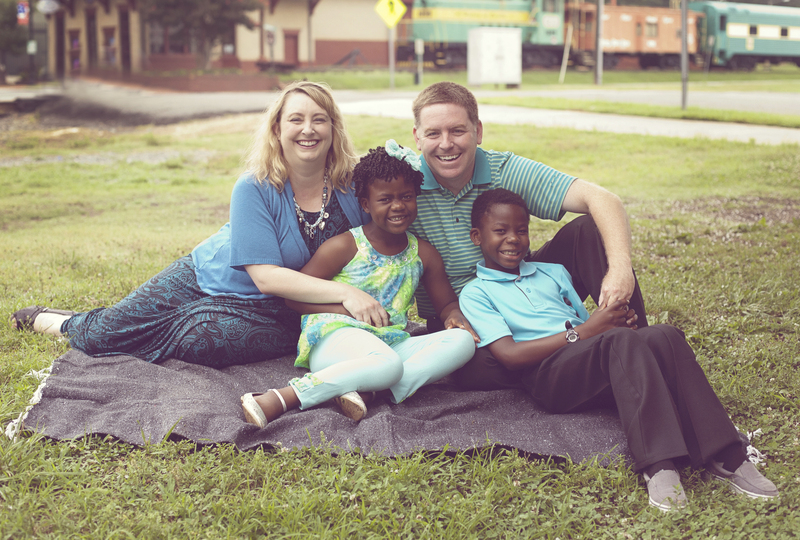 Today, Ken is able to be a stay-at-home dad, newly appointed missionary, and volunteer minister. He is allowed to preach (his primary spiritual gift) at least once a month, and is able to dedicate his full-time efforts to getting us to the mission field. Ken is renewing his knowledge of French and preparing to minister to pastors across West Africa in English and French. We eat dinner together at our dining room table every night. God is doing amazing things in Ken’s life. Two years ago, I was battling a third week in a row of pneumonia, which triggered my asthma. I was on mega doses of steroids and antibiotics just to keep me breathing, and starting a new $3500/month shot to try to keep me from being disabled from my asthma. I was too busy to be hospitalized, as our new little family could not take any more absences with Ken already being gone every night. Yet between working, taking care of Addie’s medical needs, re-aging the kids, getting them moved into new grades, and functioning as a single parent in the evenings, I was too busy to get well. I was suffocating physically and emotionally. Today, I have been off of all asthma medicines for four months, even when we went to Africa, where the air is smoke-filled from hundreds of thousands of people burning their trash. I feel better than I have felt in a decade. I am preparing to start a new clinical job where I will be seeing geriatric patients in their home, carrying my doctor’s bag with all my clinical supplies with me as I travel. This opportunity will refresh my clinical skills in preparation for the mission field, and allow me to practice medicine how I feel it should be practiced: patient-centered and holistic, without the pressure of seeing a new patient every 12 minutes. God is doing amazing things in my life. Today, I am thankful for two years. Ken and I sat alone in a coffee shop in downtown Charlotte two weeks ago, reflecting on our trip, sipping on lattes and eating quiche. Tamale would be so much different. Life would be hard. We had hoped for an overwhelming sensation of loyalty and love while we were there. We were overwhelmed. Just overwhelmed. The extra time allowed by the cancellation of our trip to Burkina Faso had proven to be very beneficial. Within 24 hours of getting sick, my travel sins were forgiven, and I was on the mend, ready to travel again. The remainder of our time in Tamale had been spent in numerous conversations about logistics, where our kids would go to school, how I would earn the right to practice medicine in Ghana as a physician assistant, where we would live in a rapidly changing housing market, how we would focus on sustainability and dignity among the Ghanaians. We visited stores, schools, clinics to try and gain an image of what life would look like if we lived in Tamale. We had a huge decision to make. Pros versus cons. Mourning what we would give up. Relishing what we would gain. Trying to see down the wide road, and the narrow road. For over an hour, we went back and forth. Which life should we live? It’s always been easy for me to have faith for someone else — to say, “of course you should become a missionary.” It’s much harder when the decision is mine. Tamale was overwhelming. Uprooting the kids. Selling our house. Saying good-bye to cousins, aunts, uncles, and parents. Rehoming our dogs. Getting rid of the vast majority of our possessions. Saying goodbye to the comforts of America. Living a life completely dependent on God and His people. Moving halfway around the world. In the end, we had to ask ourselves: What is most important to us? Which existence is worth the investment of our lives? The American dream. A 3 bedroom house with a Jeep and a minivan. Two kids. Two dogs. An acre of manicured lawn. Plenty of clothes, toys, and expendable income. Comfortable jobs where sharing our faith would be easy, but lives changed would be infrequent. We have tasted the American dream and find it, well, lacking. The life of missionaries. A cinderblock house at the edge of the desert. Two kids. A city mired in poverty and darkness that needs the light of God’s love. The need for investment is tremendous but rewarding. Sharing our faith would be difficult, but souls are frequently being transformed, and churches are growing in number and need the kind of mentoring we could provide. We have tasted what God is doing in Africa, and find it rewarding. Ultimately, our lives are not our own. Ken and I want to live a life which is most glorifying to God, in a location where God is working in miraculous ways, and which best fulfills the Great Commission. At the end of our lives, we want to have no regrets about whether or not we could have done more to invest in God’s kingdom. There is no better life investment than one that gives our best to see others know God and glorify Him. We are overwhelmed that God would even ask us to be a part of such great Kingdom work. We are moving to Tamale, Ghana. I awoke with a start. I wasn’t sure if I had a bad dream or a bad dinner, but I was drenched in sweat. “Don’t go, don’t go.” pulsed through my head as if a dream lingered that I could no longer remember. I sat up, and drops of sweat splashed off my nose and chin onto the sheets. I felt dizzy, nauseated, achy, confused. “Don’t go. Don’t go.” Wait, don’t go where? Where am I? I oriented myself from the light from the balcony outside of our room as it peeked through the curtains of our air-conditioned hotel room. I remembered I was in Tamale, Ghana. The next morning, we were leaving for Ouagadougou, Burkina Faso. “Don’t go, don’t go, don’t go, don’t go” drummed with every heartbeat. Burkina Faso is a brand new mission field for Global Partners, the missions department for The Wesleyan Church. A small, landlocked, and primarily Muslim nation located just north of Ghana, Burkina Faso had only months prior received three of the most recent Wesleyan missionaries from Haiti, and we were going to visit them. We have been praying for these three men for months, and have their pictures on our refrigerator at home. This is the first time The Wesleyans have sent missionaries from one developing nation to another on a completely different continent, and in a completely different culture. The only commonality was the French language. For this reason, Ken had spent months with Rosetta Stone, brushing up his French. My shoe had fallen off and I had stepped in the mud on Sunday. I had eaten raw or undercooked produce . . . at most meals. I had been bitten by all manner of mosquitoes and black flies at least a dozen times. I had accidentally rinsed my toothbrush with tap water instead of bottled water. I ate a meat of unknown origin and questionable identity for dinner the previous night. There was a known cholera outbreak in the city where we had stayed in southern Ghana. As I bowed before the porcelain throne of repentance, the list of differential diagnoses was narrowed to one: E. coli. No one likes an E. coli infection. Especially in a foreign country. Especially when you are planning on traveling back to the United States and they won’t let you on an airplane unless you’re the picture of health. Especially when any febrile complaint will be perceived as Ebola, even when you have remained hundreds of miles of African dirt roads and several borders from the nearest case, and it is only contagious by contact with infectious body fluids from a symptomatic person. I knew I didn’t have Ebola, but I knew the paranoid American public would never believe me. I was not afraid of Ebola, but I was afraid of American’s fear of Ebola and what they would do to me if I got sick while in Africa. I scrambled through the portable pharmacy I had brought with me for Cipro, and downed my first dose of absolution before waking Ken. I sat next to Ken, ashen and still sweating giant beads of sweat like raindrops. “I can’t go to Burkina Faso,” I muttered. “I have to stay here.” It was all I could get out before I was exhausted and doubled over in pain. I didn’t have the energy to explain the weird dreamlike sensation to not go to Burkina Faso. It was probably just my fever anyway. When morning came, Ken packed a small bag, and arranged for me to stay in the hotel room another night. He brought me extra water for the day and a half I would be spending alone, and made me promise to contact the front desk for medical help if I needed it. The Cipro had already begun its work, but I was still miserable. Ken kissed me goodbye, walked out into the blazing heat, and I drifted back into a dehydrated sleep. To my surprise, two hours later, Ken walked back in the door. “There may be a small matter of a riot, so we are reevaluating if we should go. We will make the decision within the hour.” Ken explained. What the rest of my body didn’t have energy to do, my sweaty fingers did. I began to frantically search. No United States State Department Travel Warning. Then I checked news agencies, and I was shocked with what I read. News was breaking every time I hit the refresh button. Thousands of protesters were marching on Parliament. 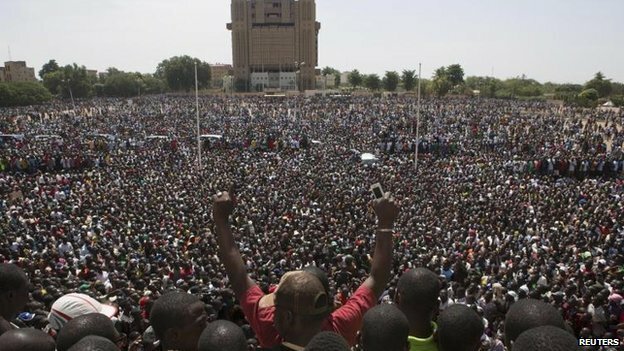 Thousands of protesters in Ouagadougou. Protesters had broken through police lines at Parliament. Police retreat. Rioters confiscate gear as police flee. Parliament is on fire and being looted by rioters. 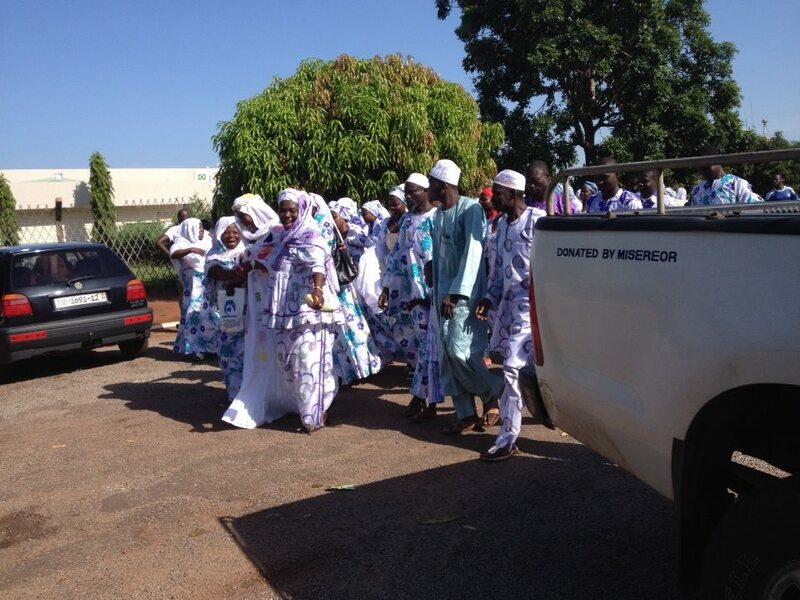 Protesters loot and burn the Parliament building in Ouagadougou. 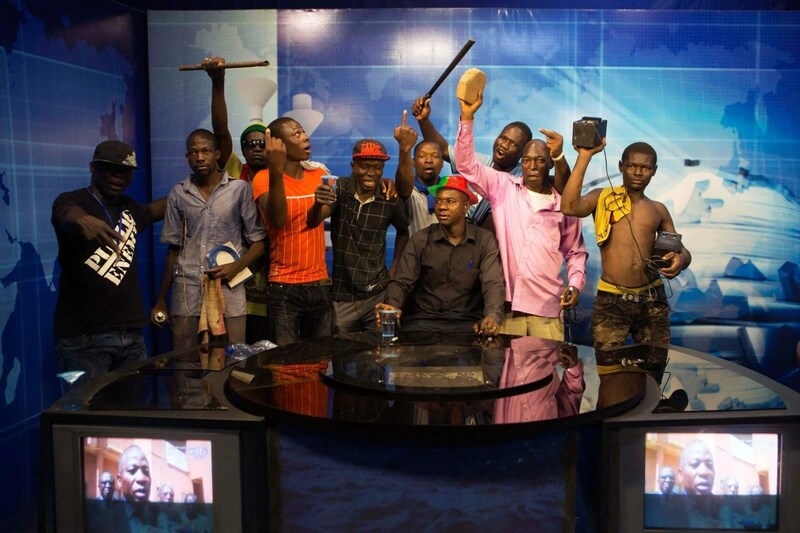 The state television station has been taken over by rioters. 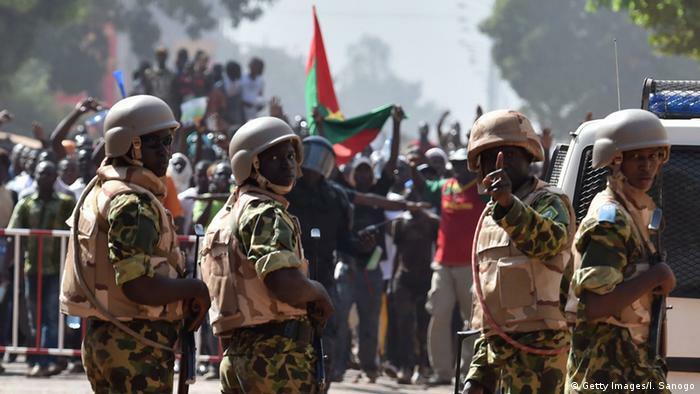 The Burkina Faso Army moves in and declares martial law, disbanding Parliament. The airport in Ouagadougou is shut down. No flights incoming our outgoing. President Campaore resigns after 27 years of power. He is looking to escape the country. Within an hour, the situation grew dire. The pounding of my heartbeat, “Don’t go, don’t go, don’t go,” began again, but not for myself. Ken had to make the decision about whether he would still travel into Burkina Faso in what looked like was going to be a complete takeover of the government by either civilians, or the Army. Ken returned to the lobby to hear what the National Superintendent, with whom he would be traveling, had to say. And then he returned to the room. I smiled, took another dose of Cipro, and collapsed in relief. Later, we realized that the Burkina Faso borders closed that afternoon, and remained closed for days. Indeed, the government has changed hands, a temporary government has been established. The United States Embassy locked down, and staff were ordered to shelter in place. Without me, Ken could not have entered the US Embassy for protection. Had Ken traveled, he would have been trapped in Burkina Faso. I would have had to either return to America without him, or wait until the border reopened. It’s not every day that the country you are planning to visit collapses. 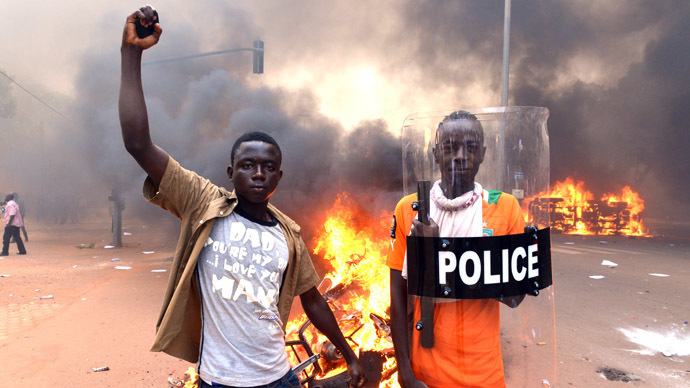 The situation in Burkina Faso is currently in transition. The former president is still on the move, going from Ivory Coast to Morocco, seeking protection. Civilians are now wrestling with the military, who assumed power. But the people of Burkina Faso didn’t overthrow the government to put a military leader in power. The hope is that within a year, free elections will be held. It doesn’t take much imagination to realize what an important time this is for Burkina Faso. As a Muslim nation, they have been a key ally for US interests in the area as they fend off Al Queda and other radical Islamic groups in the region. The next year could determine whether Christian missionaries are allowed to stay and be safe in the region, or whether they will be ousted. The next year could determine whether Burkina Faso will continue to be one of the fastest-growing areas for Christianity in the world, or whether the sharing of the gospel will be restricted. The next year is a great time for the saints to be lifting up the nation of Burkina Faso and the missionaries there, who may have a tenuous window of time to share the steadfast message of the gospel. Ken and I sat in the back of the first ever Ghana North Wesleyan District Conference behind dozens of other delegates. We were thankful for the fans overhead, which blew against the mid-90-degree heat, providing some relief from the rising temperatures. After Ken gave the morning devotional, we sat watching this newly formed conference conduct business for the first time. A pastor and his beautiful statuesque wife arrived a few minutes later, and sat near the back just in front of us. As the wife sat down, I noticed their sweet chunky baby strapped to her back. The baby definitely noticed us. Her deep brown eyes were wide open and affixed on our very white skin. She likely thought she had seen two ghosts, or that her vision was failing. I attempted to entice her to smile, giggle, wave, with no success. Her lips sucked on her dimpled fingers and her Afro-puffs bobbed in the air, but she would not react to our attempts to woo her. Still, I adored her. Aren’t babies the best? The chubby cheeks. The fat rolls on the legs. The babbling of newly formed words.The slight-tipsy awkwardness as infants learn to touch, grasp, crawl, and walk. Babies are fascinating to watch. You can almost see their brains processing new information, figuring out how to apply it, making mistakes, and learning from them. What babies learn is so important in their early years because it shapes much of how they will grow for years to come. Yes, babies can be a lot of work, but the work is so gratifying because there is so much immediate learning when something new is taught. The business of the district conference began, and we were fascinated to hear the reports of the officers. In this northern region of the country, where 62% of citizens live on less than $1.25 USD/day, 75% are illiterate, and only half of children are enrolled in school, funding ministry efforts is a significant concern. How can churches be built to provide for congregations in the rainy season? How can pastors be paid to care for flocks when most members can barely care for their families? The goals of the Northern Ghana District are to be self-administrating, self-propagating, and self-supporting. The district delegates discussed the use of farming to supplement income brought in by tithes and offerings, and ways churches could work together to raise crops and livestock for God’s glory. Not one car wash was discussed. Nor were there any fundraising dinners suggested. No jewelry sales, bake sales, or gift auctions. Disposable income is not a concept they are familiar with. But they are familiar with farming, and hard work. They even voted to require all members of all churches to give above the amount of their tithe to build new churches in the district. Another moment later on that caught me off guard was the discussion of childrens ministry. The goals of the childrens ministry was to train the Sunday School teachers how to teach a Bible story, sing a song, and play a game with children. No discussion of video production techniques, worship band formation, or security tracking systems. The simplicity was fascinating. Children’s ministry was so new and unencumbered by things most of us consider essential. Christianity itself was new. At one point one of the delegates raised his hand and asked, “Can I ask? What is a Wesleyan?” The church is exploding at such a rapid rate in northern Ghana, most Wesleyans were Muslims or animists in the recent past. Discovering who Jesus was is central to their journey of faith, and John Wesley isn’t found anywhere in their Bibles. How does one explain not only what a global church is, but also John Wesley’s role, in two minutes or less? As I sat and listened to the discussions, contemplations, and questions, I realized that this is how the apostle Paul must have felt on his missionary journeys, working with new churches, training pastors, clarifying doctrine. Everything churches were doing was being done for the first time. How exciting it must have been to see churches grow and learn in their faith first-hand! Yes, new churches can be a lot of work, but the work is so gratifying because there is so much immediate learning when something new is taught. What new churches are taught is so important because the information will shape how they grow for years to come. In all of Ghana, there are only 10 licensed ministers and 4 ordained ministers for over 50 churches. With no Wesleyan Bible schools in Ghana, training pastors is a challenge, but a tremendous opportunity for hands-on investment with monumental Kingdom rewards. A significant part of Ken’s job in northern Ghana would be working with these new converts-turned-church leaders, training pastors, clarifying doctrine. Everything these churches are doing is being done for the first time. Watching these new gatherings of believers grow and change has to be one of the best parts of building God’s Kingdom. After all, aren’t new churches the best?! The tall green grasses of the African plains waved greetings to us as we rode into the city of Tamale in the church van. The African sun brought unrelenting dry heat to the land. Mud huts sat huddled along the roadside in small villages. Motorcycles and scooters buzzed around our van on roads that were, dare I say, smooth, for the first time since we arrived in Ghana. As we entered the city, the contrast of centuries surrounded us. For the most part, the clock had been turned back 100 years or more. There were no supermarkets, fast food restaurants, or anything much in the way of modern conveniences. The evidence of poverty was reflected in the numerous children who worked along the roadside during school hours. The gaunt faces of hunger were dispersed through the crowds. The homes of pieced-together scraps of wood, metal, mud, and grass were scattered among the brick walled-in palaces. Mud huts sat next to modern gas stations with mini-marts. Internet cafes were hosted in ramshackle ruins. The church on every corner was replaced by a mosque in every neighborhood, and the haunting calls to prayer echoed through the air. Almost all women had their heads covered, most in a hijab. This was definitely not the same as Accra. My brain fought to push back the images of radical Islam in my mind, and I prayed that God would replace the thoughts put in my mind by Western media with His perspective. I began to envision the spiritual darkness that these people live in, especially the women of Tamale. They are limited in their contact with people outside their families. Their husbands often control how much health care they get, what spiritual influences that they have, and the punishment for disobedience can be severe. With one physician for every 93,000 patients in this region of Ghana, health care is already scarce. But considering that Muslim women cannot be cared for by a male physician creates a nearly impenetrable gender barrier. The story of one woman in particular hit home with me. Her name is Lapah, and she had been sick for many years. She had sacrificed animals. Still sick. She had prayed to idols for healing, with no results. When the Jesus Film came to her village through the ministry of Global Partners, she prayed to receive Christ, and prayed for healing. And the power of Jesus Christ healed her. Not only was she saved, but her daughters were saved as well when she shared what the One True God had done for her. In southern Ghana, Jesus is on every sign. Modern conveniences are everywhere. Life would look a whole lot like what it does here in America. Accra would be comfortable. In northern Ghana, Islam is on most signs. Modern conveniences are hard to find. Life would be much harder — finding food, water, and relief from the desert sun would be a daily struggle. Tamale would be intimidating at best. Frightening at worst. But which city does Jesus weep over? By the time we left Accra early Tuesday morning, I was in love with the city. Ranked as Africa’s second most liveable city, I loved how Accra was the best of Africa and the best of the West. Roadside market stands sold everything from yams to microwaves, yet supermarkets rivaled any American supercenter with fresh produce, appliances, and a great selection of frozen food. The people of Accra were very friendly, and didn’t seem to notice how white our skin was in a sea of beautiful black faces. The Wesleyans have a 24-hour clinic just outside of Accra that I could easily fit into. And even though I have lived in the Bible belt for many years now, I was surprised that Jesus was incorporated into almost everything in the city. “Lion of Judah Taxi Cabs,” “Light of the World Bicycle Shop” or “Higher Ways Hair Salon,” were just a few examples of faith statements in local business. What surprised me even more was that even American companies adopted Christian slogans, “Start the day God’s way: Nescafe” or “Blood of Jesus: Coca Cola.” The steeple of a church rose above surrounding buildings on nearly every block. Obviously, there was no separation of church and anything! But Accra wasn’t the only place we were to visit during our time in Ghana. We also were to visit Tamale (pronounced TOM-ah-lay). We were going to be visiting with the pastors there, but also evaluating Tamale as a place we might potentially live. Tamale is the capital of northern Ghana and is the fastest growing city in all of West Africa. While Accra was clearly Christian, Tamale is predominantly Islamic. Muslims and Christians tolerate each other, and under the best of circumstances can even be friends. I was anxious to see how this relationship worked in person. The plane landed on the runway of Tamale Airport early on Tuesday morning as the arid sun pierced the landscape. We taxied toward the single-gate airport, and witnessed the massive earth-moving machines constructing a new international airport to support the growth that Tamale is experiencing. As we parked on the tarmac, I noticed that there was a crowd dressed mostly in white on the other side of the fence, just yards from our plane. As we stepped off the plane, the crowd erupted with shouting and heart-piercing African drumbeats. I was close enough to recognize traditionally dressed Muslim men and women. Hijabs and kufis adorned every head. As we exited the airport with our luggage the still-screaming crowd pressed in on the sidewalk, yelling, hands waving high in the air, with drumbeats underscoring the tension. There was no way for us to exit the tiny airport other than to walk straight through the crowd. I was wearing very conservative clothing, but not compared to a Muslim woman. I had on short sleeves. My ankles were visible below the edge of my maxi skirt. My head was uncovered. I was clearly not one of them. This was my first time in an all-Muslim crowd. An all-black Muslim crowd. In Ghana. In a predominantly Muslim city. I had no idea what to expect. Would they fight me? Push me? Ignore me? The only way to find out was to push through the shouting crowd to get to the parking lot beyond. I took a deep breath and stepped forward. The crowd shuffled aside to let me pass on the sidewalk, but their cheering did not stop. Rather, it ramped up in volume. It took me a minute to understand what they were saying. “Welcome! Welcome! Welcome!” they shouted as the women lightly patted my shoulders. The drumbeats somehow seemed less ominous, and somewhat more celebratory. I looked into their faces and saw excitement, and even kindness. The crowd of Muslims leaving the airport after celebrating our plane’s arrival. As I exited out of the other side of the flock of my new closest Muslim friends, I smiled in relief, and hoped that the rest of my visit to Tamale would be just as pleasant. Unfortunately, Tamale had a few more surprises in store for me. The police flashlights swept quickly through our vehicle — over our faces, into our laps, into the back of the vehicle. I held my breath as the all-too-familiar scene of being stopped by police in Africa played itself out. And then they waved us on. And then it happened again. Police skimming our vehicle with flashlights. Identifying the foreigners. And they too waved us on. Finally I asked Rev. Ocran why we kept getting stopped. I realized that my mind had gone too quickly into “Congo mode,” and that Ghana was a new game. My previous concept of Africa was based on the expectations I had developed in Congo, and I needed to adapt to a new country and new expectations. Perhaps more sleep and more daylight would bring greater perspective. Morning came all too early the next day. We had to travel to another town for church, where Ken would be preaching in the morning service. Daylight quickly warmed the humid air left behind by the heavy rains the night before. We rode the still rough but now well-lit roads through Tema, Accra, and into Medina on the way to church. The urban neighborhood streets leading to the church were washed out by the rains the previous night, and we had to call for help to get us to the church — just in time for the end of worship. We were quickly ushered to the front of the open air service, facing the cheerfully singing congregation. Though the songs were not familiar, the spirit was. The air was filled with not only the sounds of praises from our church, but 5 other churches in the immediate area. The cacophony of worship wafted to the heavens in a dissonant melody that was grotesque and glorious at the same time. Ken preached an moving message with the help of Rev. Ocran, who translated into the local language of Twi. The pastor of the church, Rev. Kwame Frempong closed in prayer. After the service was over, we were greeted with hugs and handshakes from our Ghanaian brothers and sisters in Christ. The next 24 hours would be filled with conversations and meetings regarding the state of The Wesleyan Church, especially in southern Ghana. While we had seen a beautiful example of God’s people worshiping together, the church overall is experiencing growing pains. Of the dozens of Wesleyan Churches in Ghana, there are only four ordained ministers. There is no Bible college for Wesleyan pastors in Ghana, so creative methods have been employed to train pastors as quickly as possible. Their requests and wish lists were not complex. A study Bible. I knew that I have at least 5 sitting at home on my shelf. Curriculum. Ken and I are curriculum collectors and writers. My first job out of college was writing curriculum for The Wesleyan Church. Ken has written or adapted his own curriculum for the past two decades. They had none. Walls for their church. Not marble floors, nor a baptistry, nor a giant spinning globe to prove how missional they were, nor air conditioning for the awful heat. They wanted walls to enclose them and protect them from the rain during the rainy season. I didn’t know the answer. I was afraid of the answer. Since I’ve returned to the States, the answer has been more disappointing than I had anticipated. Research has shown figures as high as $1.5 million dollars spent by churches per baptism in the United States. Not that we spend that number directly on each person, but others studies show that of all of the money spent by The American Church, there are relatively few converts. Statistically speaking, if a church is older than 10 years, it takes an average of 85 people to win one person to Christ. The vast majority of church budgets are spent on staffing and maintaining the church, not reaching new souls. For years, I have wrestled with church dinners, youth group all-nighters, seasonal children’s parties, ski trips, even mission trips where not one new person is reached with the gospel. We have become master maintainers, instead of master soul winners and disciple makers. The dissonance of the Western culture of Christianity and the dilemma of the church in Ghana was just as cacophonous as the melody of worship on Sunday morning. While we are all worshipping God simultaneously, we were doing so in such different ways. I had defined the activities of the church according to cultural Christianity in the United States, rather than having the global perspective of The International Church. When in America had I ever been a part of a church that considered stopping evangelistic efforts because the church could not support all of the newly converted Christians? Just as I had to redefine my expectations of the police in Ghana versus Congo, I had to begin to rethink my expectations of Church and my role in God’s Kingdom. What is the purpose of The Church? If I have but one life to live, where would God have me invest my life? Where will I be most effective accomplishing the mission of The Church? Was God calling me to change my tune?